Street trees make Beacon Hill streets colorful. Photo by Wendi. The Seattle Department of Transportation (SDOT) is hosting a meeting tonight at Van Asselt Community Center to get your feedback about street trees and a revision of the street tree ordinance, which was last revised in 1961. The new revision is intended to improve protection and preservation of street trees. 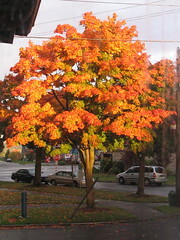 Street trees are defined as any trees growing in any city right-of-way. The draft ordinance may be read here, and addresses tree protection and preservation, restrictions on tree removal, requirements for replacement trees, requirements for private tree companies, and penalties for violations of the ordinance. Tonight’s meeting is at Van Asselt Community Center on South Beacon Hill, 2820 S. Myrtle Street, from 6:30 to 8:30 p.m. The Van Asselt meeting is one of five community meetings. The first was held Monday night at Highpoint Community Center and three further meetings are also scheduled for Miller Community Center, Meadowbrook Community Center, and Ballard Community Center. You can find out more about the ordinance and upcoming meetings, and submit comments online at the SDOT website.